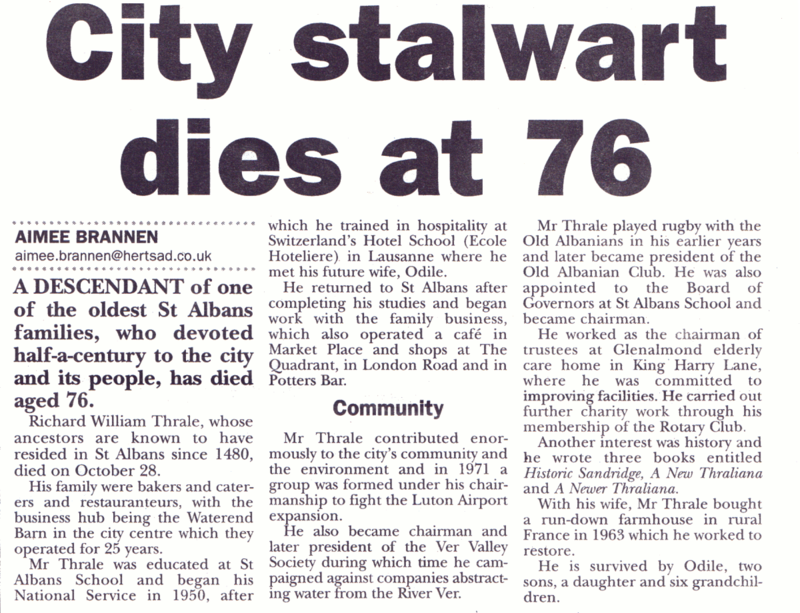 Herts Advertiser 8 November 2007, page 4.
aimee.brannen@hertsad.co.uk A DESCENDANT of one of the oldest St Albans families, who devoted half-a-century to the city and its people has died aged 76. Richard William Thrale, whose ancestors are known to have resided in St Albans since 1480, died on October 28. His family were bakers and cater­ers and restaurateurs, with the business hub being the Waterend Barn in the city centre which they operated for 25 years. Mr Thrale was educated at St Albans School and began his National Service in 1950, after which he trained in hospitality at Switzerland's Hotel School (Ecole Hoteliere) in Lausanne where he met his future wife, Odile. Mr Thrale contributed enor­mously to the city's community and the environment and in 1971 a group was formed under his chair­manship to fight the Luton Airport expansion. He also became chairman and later president of the Ver Valley Society during which time he cam­paigned against companies abstract­ing water from the River Ver. With his wife, Mr Thrale bought a run-down farmhouse in rural France in 1963 which he worked to restore. He is survived by Odile, two sons, a daughter and six grandchil­dren.